This new DCC sound-equipped ACS-64 includes a TCS WOWSoundÂ® CD-Quality 16-bit 44,100Hz decoder with Audio AssistÂ® for easy configuration without programming CVs and a Keep-AliveÂ® device for uninterrupted operation, even over dirty track. The WOWSoundÂ® electric locomotive sound package includes horn, bell, cooling fan/power inverter, pantograph extension and retraction, coupler close/release, brake release and application, momentum, crew alert, grade crossing quill, departing and arriving station announcements, and more. 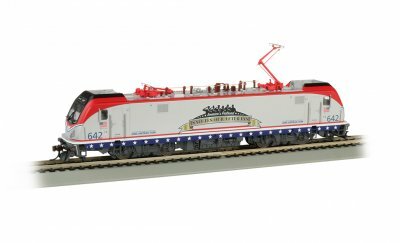 The locomotive with all new tooling also features fully remappable light functions, die-cast frame, and selector switch for choice between rail and pantograph operation.